I have to admit that I’d never heard of Hobby Lobby until the first time I went to Alabama with Geoff. The first time I actually laid eyes on one I started laughing. I couldn’t believe that someone would actually name their store something that utterly ridiculous. It turns out that’s not the limit to their ridiculousness. Hobby Lobby is one of those retailers run by Evangelical Christians. The store isn’t open on Sundays so that their employees can observe the sabbath in proper fashion. While they’ve had skirmishes in the past with the law, most notably with discrimination complaints by the ton, they’re recently reached a new low. They’re suing the Federal Government over the Affordable Care Act (aka, Obamacare) and the provision in it that requires that women have access to free birth control pills. Yes, really. As their argument is an old, worn, and completely fallacious one that will undoubtedly be tossed out on its ear, I’m not actually worried. I am, however, horrified that these people who happen to own a business honestly think that their female employees don’t deserve access to a medication. Yes, folks, birth control pills are actually a medication. They do much more than just keep us wimmin’ folk from getting pregnant. Just ask anyone who’s ever had endometriosis, hormonal migraines, or fibroid tumors. Go ahead, ask. I dare you. Fear not, as always there is something that you can do about this. First, the internet came up with a petition thanks to the good people at Ultraviolet. Go here to sign the petition. Naturally a boycott was launched simultaneously. 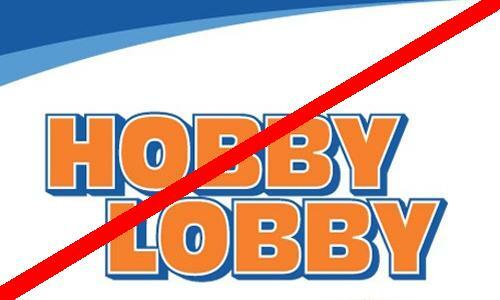 The petition has gotten a lot of traction but not enough as Hobby Lobby is continuing with the suit. So, Ultraviolet has gone to the crafters themselves and to Tumblr. This is the email from Ultraviolet and I think it speaks for itself. If you like to knit, crochet, make jewelry, scrapbook, make pottery, or anything along those lines, you can use your skills to send a message to Hobby Lobby by putting together a project that expresses your thoughts on Hobby Lobby’s lawsuit. For example, you could crochet a message to Hobby Lobby, use your scrapbooking skills to make a collage, or paint a picture expressing your opinion. Then, just take a photo of your project and upload it to our new “Hey, Hobby Lobby” Tumblr page—we’ll showcase your submission and those of other UltraViolet members, and make sure the news media and Hobby Lobby see them. How often do you get to do arts and crafts for women’s equality?! Quicker projects are better of course—the sooner we get your message, the sooner we can spread it around and send it to Hobby Lobby. Check out the Tumblr page, and get started on your project today! Your message can be short and sweet like “Boo Hobby Lobby!” or “Hobby Lobby, You Stink!” or you can say something more like “Hobby Lobby: I’ve Got a New Hobby Shop,” “Hobby Lobby: Respect Women,” or “Hobby Lobby: Free Our Birth Control.” As long as it’s personal and it’s not offensive, it should be great. Hobby Lobby is an arts and crafts store that, like any other company, cares deeply about what its target customer base thinks of them. So let’s show them how enraged their customers are—and the creative, talented potential customers they will be losing if they don’t drop this lawsuit. Can you take some time today or tomorrow to put together a quick project, take a photo, and upload it to our Tumblr site? Time is of the essence here, since we want to keep the momentum going, so smaller projects are definitely better. Check out the link below and get started. And have a lot of fun—the more creative, the better. Remember that in addition to this protest and boycott, you can do your part by voting in November. Don’t vote for any representative, congresscritter, senator, or, oh, Mitt Romney, who would go along with something like this. Women’s rights are civil rights. Fight for them. Speak up. Do your part. Vote. Even beyond any of that you state, I CANNOT believe Green – as ferocious as he is over preventing a birth before it occurs – can somehow make billions by supporting a communist government that not only condones, but enforces female infanticide, abortion, etc. I’ve worked there before and you might be surprised to hear some of the “unholy” behaviors accepted by management. You go Mr. Green! Sleep tight! I just bet Truett Cathey is fit to be tied over Green comparing himself to him. I don’t agree with Cathey either, but he is in no way, shape or form as bad as Green. Green is simply a great self-promoter and is looking forward to a great Jan. 5th. I think their fines for violating the court order started yesterday. At this point I hope that paying over a million dollars a day in fines will either change their minds, or force them out of business. What’s going on January 5th?